The Opensource.com team gathered in one of the large conference rooms at Red Hat tower in Raleigh on March 21 to make an open hardware day of it. We ordered some delicious burritos and discussed how the next few hours would unfold. We decided we'd load up Arduino software on my laptop, switch on the ginormous monitor in the front of the room, and see if we could make some blinky lights happen—maybe even make an LED display come to life with something like: "Opensource.com for the win." After we ate as much queso dip as possible, we opened up our newly purchased Starter Kit for Redboard and got to work. Somewhere in the midst of half reading the directions and half plugging in wires and matching up colors and symbols, we figured out how the hardware and the software would work together... though we didn't quite complete the task before it was time to move on to our next open hardware staff day activity. But, as you know, learning is about the journey, and our tinkerings had demystified some of the processes involved, helping us better understand the logistics behind the open hardware projects people share with us. We had Bananagrams around for moral support. Next, we headed downstairs to the cafeteria on the ninth floor (after lunch hours) to meet Ian Hands for a 3D printing tutorial. 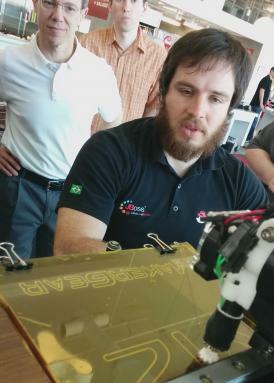 He set up his MakerGear 3D printer on a high top table and was booting up the software and hardware side of things when we showed up. While the 3D printer was warming up—to melt the plastic filament the extruder nozzle gets hot (around 500°F) and the platform warms but to a lesser degree (around 50°F)—Ian told us about some of the things he's 3D printed and that he keeps all of his designs in the open on GitHub. Finally, we started printing! What looked like a flower at first, eventually became a small gear. Our last activity of the day was to fly the copter we named XFrog. (Can you fly or sail anything without a name?) With a name and a will, we set out to find an open space—so we could jump out of the way if XFrog got out of control! Have you ever manuvered a toy-copter? There are two controls that you work simultaneously: one to drive the copter up into the air and one that takes it in any direction. It's pretty addictive, because even though no one is really good at it at first, each time you try it, you realize that if you just give it one more go, you'll get it a little higher with a little more control. XFrog takes flight with Jason Hibbets at the controls! Even though the copter isn't open hardware, flying it around that day was part of our teammate Jason Baker's plan to make "a bigger, badder, more-open drone." And, that's the goal. To test things out, to try your hairbrained idea, and to see what you can make. 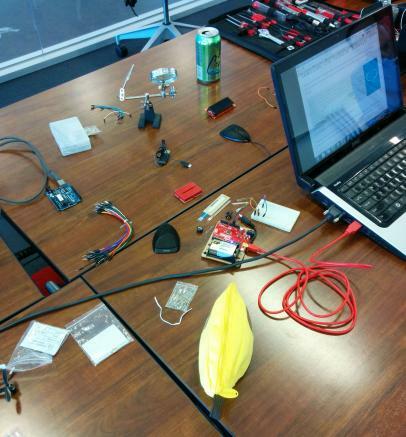 In every way, our open hardware staff day was awesome. It was great to get out of the online world and into the physical world for a bit. We hope to do it again soon. See all of our photos at our Facebook page. Lucky. Some workplaces would charge admission if they thought their employees were having this much fun. Thanks so much for capturing the fun and excitement of that day, Jen. I think it's the joy of possibility that makes open hardware and maker culture so great, and we're just scratching the surface here. I can't wait for our next maker day! So great to see what you have been up to that day. No soldering? Those boards seem to come with 'patch' like cables, really need to get one myself one day. Yeah, we had our soldering irons at the ready, but it wasn't necessary for what we were working on. Next time!